AIR ZIMBABWE has decided to lease aircraft because neither the Government nor the national airline have resources to buy new planes, an official has said. Transport, Communications and Infrastructure Development Permanent Secretary Mr Partson Mbiriri, yesterday said contrary to media reports that Airzim had purchased an Airbus A350, the national airline was assessing which planes to lease. "Not every plane that lands at the Airport belongs to Airzim, it is true that the national airline needs new aircraft but neither Government nor Airzim has the resources to purchase them," he said. "What is happening is that Airzim is exploring and assessing the leasing route because it's cheaper to lease than buy one when we don't have the resources." Mr Mbiriri said since Airzim was assessing which planes to lease, it was inevitable that some planes would be seen at the Airport. He said some companies would send their aircraft to Airzim to market them. "Some of the vendors even go as far as painting the planes in Airzim colours as a marketing gimmick. This has been happening over the years that I have been at the Ministry of Transport. 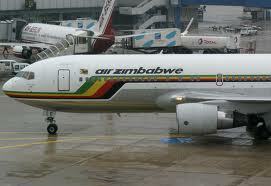 Government is obviously determined to see the national airline continue flying the Zimbabwean flag," Mr Mbiriri said. He said the Airbus 350 that had been reported as having been bought by Airzim was just being assessed for leasing by the national airline. Meanwhile, State Enterprises and Parastatals Minister Gorden Moyo on Tuesday said Government would "ring fence" the US$140 million debt, which the airline would repay when it becomes profitable. Last year, Cabinet resolved to incur the over US$140 million debt which would pave way for the restructuring of Airzim. This also comes amid indications that the Cabinet Committee on the national airline has only met once despite several Cabinet directives. MDC-T's national council last year met and called on the Government to stop funding the national airline saying it would rather be shutdown. Minister Moyo said Cabinet resolutions were policies that had to be implemented than party positions. "The Cabinet position is what matters because it becomes a policy and that resolution (debt takeover) is awaiting implementation," Minister Moyo said. He said the decision to takeover the debt was motivated by the need to make the airline's balance sheet attractive to investors. Minister Moyo said Cabinet resolved that Airzim should be restructured through a joint venture approach. "Implementation of the restructuring is now in the hands of the Minister of Transport, Communications and Infrastructure Development (Nicholas Goche). "The decision was that we are going to use the model of the Ethiopian Airways and the Kenyan Airways. It is up to the Minister of Transport to implement that decision," he said. Minister Moyo said Cabinet had instructed Finance Minister Tendai Biti to raise the funds for "right sizing" the workforce at the airline. He said the delay to clear the debt was due to financial constraints at the Treasury. Minister Moyo said Cabinet would also restructure the National Handling Services whose proceeds would be channelled towards recapitalisation of the national airline. Minister Goche and Minister Moyo have the responsibility to finalise the restructuring exercise. Minister Moyo said the restructuring documentation for NHS was ready to be presented in Cabinet for approval. Cabinet, Minister Moyo said, also agreed that there was need to properly constitute the Airzim board and management. "As we speak those people can't make decisions on their own thus they keep referring most of the issues to the Ministry of Transport, consequently leaving us with a kind of micro management of Airzim against the norms and values of corporate governance," he said. Zanu-PF and MDC say there is need for the national airline to be recapitalised so that it can be profitable while the MDC-T argues the solution lies with the shutting down of the airline. Zanu-PF spokesperson, Cde Rugare Gumbo, said there was need for the Government to implement the Cabinet resolutions. "Like any other parastatals, we can't allow Airzim to liquidate, we have a responsibility to make sure that Airzim is capitalised and that is possible if Government takes the debt," Cde Gumbo said. "The airline has to recapitalise so that it can fly the Zimbabwe flag because we believe an airline is a marketing strategy for the country. We want it to be run on a commercial basis so that it generates profits." MDC deputy spokesperson, Mr Kurauone Chihwayi, said there was need for the Government to engage an investor who can help resuscitate the national airline. "We cannot dump Airzim, the only dumping we can do is in the hands of an investor," Mr Chihwayi said. "We expect the major shareholder to capitalise the national airline and if Government can't do that then an investor should come in with the money because it cannot continue in the state that it is in where workers can go for seven without getting paid." He said Government was supposed to be flexible and allow the investor to own more than 49 percent stake in the airline. However, MDC-T spokesperson, Mr Douglas Mwonzora, said the only way to solve the problems at Airzim was to implement the MDC-T resolutions on the airline. "If Cabinet has failed to implement its resolutions it shows there is something wrong. We believe the problems at Airzim are persistent and our view is shut down Airzim, pay workers their packages, get a partner and then run it commercially," he said. Mr Mwonzora said there was, however, need for the Government to find other ways of settling the Airzim debts.